The Flytec 6000 is the ideal basic instrument which provides to the pilot all required basic functions, but without having to accept any compromise in regard to quality and precision. Perfectly suitable for training, beginners and the sole hobby pilot. The instrument’s technology is based on the 6005/10 series. Power supply: 2 Alkaline batteries AA NiMh- accumulators continuous monitoring of battery voltage, auto power-off when not in use. 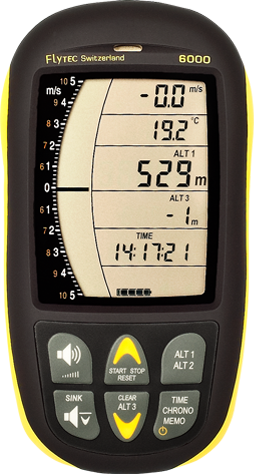 This program is used for upload of firmware updates on flight instruments of series 5020 and 6000 (6015 included). For correct functioning of the flasher the software application requires the PROLIFIC-USB-driver.